Enter 2011, my 24″ 1080p flat panel LCD, and an ATI Radeon™ HD 5870. With this newer hardware, I knew I’d have no problems running Doom 3 on “Ultra” with fast framerates. Once I downloaded the game via the Steam client, I immediately fired it up and went to the graphics options. To my dismay, the only resolutions available to choose from were non-widescreen. Sure, I could play the game on “Ultra” at 1280 x 1024 again, but I wanted the full 1080p experience. I browsed multiple forums and blogs about the subject, looking for a fix. The first promising solution based on the information I found was to open the DoomConfig.cfg file (located in the doom 3/base directory) with a text editor, find the lines for seta r_customHeight, seta r_customWidth, seta r_mode, and seta r_aspectratio, then set the height and width values to my monitor’s resolution, change seta r_mode to “-1” (this tells the game to use the custom resolution), and change seta r_aspectratio to “1” (this is the 16:9 setting, for 16:10 use “2“, and for standard 4:3 use “0“). Unfortunately, this didn’t work for me. I tried setting the values and then setting DoomConfig.cfg to read-only, thinking that maybe the game was resetting the values, but for some reason the game just wouldn’t use the values I set. It may depend on the particular video card, drivers, or installation configuration I’m using, but for whatever reason, it didn’t work for me; it might for you. This did the trick for me! I like this solution in particular because I don’t have to make any changes to the original configuration file that Doom 3 uses. If I decide to play the game without any customization to the resolution, I can simply delete the autoexec.cfg file. Note: I came across multiple forum posts from people saying that this didn’t work, then eventually they figured out that they’d done something to break the configuration or typed something incorrectly and when they fixed their mistake it did work. One common issue was that the menu for the game doesn’t actually render at a higher resolution, so people were thinking that the new resolution hadn’t worked; however, you have to actually play the game to see the changes take effect. If it’s not working for you, you’ve done something wrong. 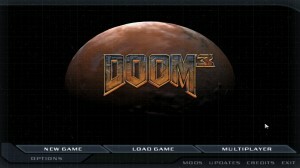 The Doom 3 main menu still uses lower resolution graphics when a custom resolution is set. My monitor stretches the image to fill the entire screen, but you can see that it looks a bit fuzzy due to the upscaling. 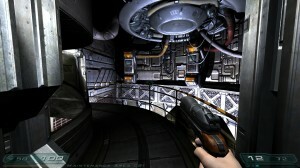 Make sure you start with a clean, fresh installation of Doom 3. This means if it’s been installed before and you’ve tried tweaking configuration files or used mods, uninstall the game and any mods, then delete any leftover files from them in the Steam folder and any other folders where they create files. Once the game is installed, start it up and set your desired graphics settings. Keep the anti-aliasing to a maximum of 8x (there is a bug that some people reported when using 16x with custom resolutions). Make sure you click Apply Changes. Exit the game. Open Notepad or your preferred text editor and add the commands from my example above. Be sure to use the native resolution of your monitor for the height and width. If you have a 16:10 monitor, use “2” instead of “1” for the aspect ratio. Save this file as autoexec.cfg in the doom 3/base folder. Whenever you launch the game from now on, this file will be executed to set your resolution to the custom values, all without manually editing the DoomConfig.cfg file (it’s always nice to avoid editing original game files). The menu will still appear in a lower resolution. You have to start playing the actual game to view your custom resolution. The end result is rather nice, don’t you think? 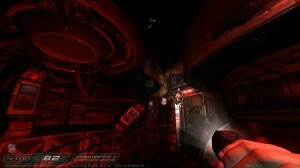 One of the many corridors you'll walk through in Doom 3 - in widescreen. The same corridor, from the other direction, now with red lights and a body - in widescreen. 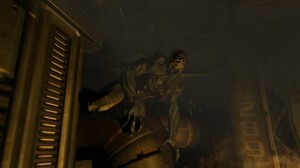 One of the many Imps that you'll encounter in Doom 3 - in widescreen. For even more fun, I installed the Last Man Standing Coop mod for the game so I can play the game cooperatively with a friend. 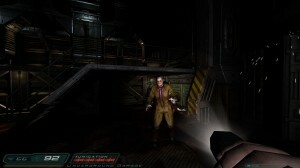 The mod even includes a remake of the first episode from the original Doom game, re-envisioned using the more modern id Tech 4 engine. It’s nice to know that with a few tweaks you can still get a great gaming experience out of some of the older games on the market. If you’re looking to play other old games on a newer system in widescreen, check widescreengamingforum.com for more tips, patches, and hacks. If you’ve found any other good ways to improve the Doom 3 gaming experience, let me know in the comments! It’s hard to say what the problem is without knowing your exact hardware configuration, software, etc. Does the game run OK without the autoexec.cfg file in a non-widescreen resolution? Are your video card drivers up to date? Is your monitor’s native resolution 1680×1050? What version of Windows do you have? What make/model are your monitor and video card? Do you have any mods installed? Do you have the Ressurection of Evil expansion installed? One thing you might check is to see if GPU scaling is enabled in the Catalyst Control Center. I turned this off the other day and when I loaded up Doom 3 I noticed that it didn’t properly fill the screen; it was squished into a 4:3 aspect ratio, even though it was running at the proper resolution. Turning GPU scaling back on and setting it to fill the entire monitor did the trick. Hi peter, you should be able to configure all graphics options in the Doom 3 menu. See the steps I listed above, particularly #2, and follow them in that order. For the people that can’t get it to work. In the example below my drive is K but yours might be C. The paths should be similar. You need to have the autoexec.cfg text file in. Make sure you did not accidently name the file autoexec.cfg.txt. note pad can put a txt extender on end. I leave my LCD on 1:1 fixed and disabled any screen stretching done by AMD catalyst. My guess is you have it in the wrong directory. I got my hopes up. Can you help? See #6 above; the game’s menu stays in 640×480, but when you start the actual game it will be in widescreen at your chosen resolution. Also be sure to set the aspect ratio setting to the correct value for your monitor. Double-check that your autoexec.cfg file doesn’t actually end with .txt. That’s a great tip Josh, which I have now done. Only thing is that on my monitor (1920×1080) it doesn’t extend to the whole screen. Josh, I fixed it by editing the doom3config in the end, as the autoexec.cfg seemed to conflict with the doom file. Anyway, the difference is awesome and thanks for the tips.